Welcome to Craemer Consulting. How can we help? In every workplace there are givers, takers and matchers. Most of us are matchers, looking for something equal in return for what we provide to others. This reciprocity style is predominant because it is about overall fairness. Adam Grant, organizational psychologist and author of the book Give and Take: A Revolutionary Approach to Success, says that your reciprocity style can directly impact your ability to succeed. In his research, he found that givers are often found at the bottom of the success ladder, and also at the very top. It turns out the giver reciprocity style can be either detrimental or beneficial to one’s career. 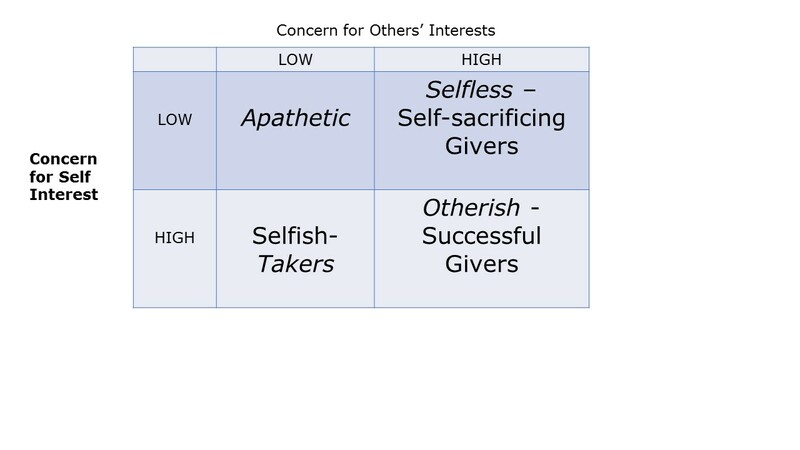 This is because givers at the bottom may be so selfless that they are “too trusting and too willing to sacrifice their own interests for the benefit of others.” Givers at the top have found a way to be successful by becoming what Grant terms otherish. While being a selfless giver is admirable, you may run the risk of burning out and developing resentment towards others. This can deprive you of emotional energy, which is vital to well-being. Selfless giving can ultimately become overwhelming without self-preservation instincts. An otherish giver is someone who maintains concern for themselves as well as others. They genuinely care about helping people, and they want to achieve their own ambitions and interests. They don’t see these two perspectives in conflict with each other. Being otherish means you’re willing to give more than you receive, but still keep your own interests in sight and using them as a guide for choosing when, where, how, and to whom you give. And there are times when you choose not to give because that time, place, method or person is in some way detrimental to you and your interests. Empathy is the persuasive force behind giving behaviors, but it’s also a major source of vulnerability. According to Columbia psychologist Adam Galinsky, when you focus only on the emotions and feelings of another you can risk giving away too much. It is therefore important that you also take into account the other’s thoughts and interests in order to satisfy the other person without sacrificing your own interests. In group settings, the best way to ensure givers aren’t being exploited is to get everyone in the group to act like givers. One unique way to encourage all members of a group to act more like givers is the use of Reciprocity Rings, which is a face-to-face exercise where every individual of a group asks for and offers help. Because everyone is making a request, there’s little reason to be embarrassed or feel overly vulnerable. And when requests are specific and explicit, each participant provides potential givers with clear direction about how they can contribute most effectively. In Reciprocity Rings people present meaningful requests and matchers are often drawn in by empathy. Takers are also likely to act like givers because they know that in such a public setting, they’ll gain reputational benefits for being generous in sharing their expertise, resources and connections. And if they don’t contribute, they risk looking stingy and selfish. This random, pay-it-forward mentality may seem counter-intuitive to the way many organizations are currently run. But companies like Bristol-Myers Squibb, IBM, Boeing, Citigroup, Estee Lauder, UPS, Novartis and GM all use Reciprocity Rings to save time and money as well strengthen the community of participants, which increase overall engagement. Using Reciprocity Rings will encourage more giver mentality in organizations, and this is beneficial to everyone. And givers acting more otherish enables them to be more successful. Providing you with a customized and collaborative approach for improving clarity and commitment in you and your organization. Craemer Consulting. All Rights Reserved.